I didn’t become a cat person until my late 20s. I grew up owning only dogs because my mom was allergic to cats. My ex-husband was a huge cat lover and grew up with lots of cats and naturally wanted us to get a cat. He said cats were much easier to take care of compared to dogs. I agreed and we went to the SPCA and adopted an adorable black kitten named Pixie. I loved Pixie from the minute I held her. She is such a sweet girl. Fast forward to today and I now have two beautiful cats, Princess and Misty. Pixie is still alive and well and living with my ex-husband. We adopted Princess and Misty as kittens in 2010. They were litter-mates, but look nothing alike. My cats are part of the family. Princess loves to play and tries to drink my coffee. My friend, Kristen calls it her “mewoffee”. Misty loves to cuddle up on the couch and enjoys licking John’s arm. She won’t lick anyone else though. Valentine’s day is coming up in a few days and I want to remind my cat owner friends to not forget about your cat! 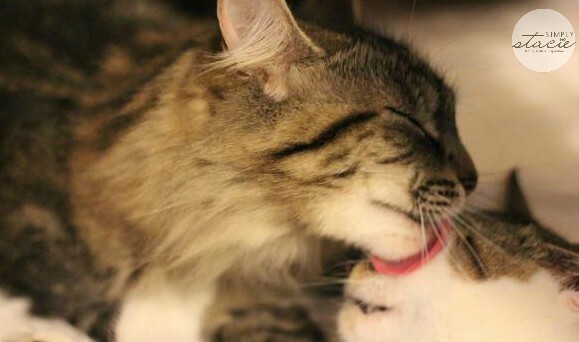 There’s very simple ways you can show your cat some love this Valentine’s day. 1. Show your cat some attention. Even if it’s just for five minutes! Both my cats love having their tummy rubbed. They’ll lie on their back and wait for me to pet them. I can’t do it as often as they want it or I’d get nothing done, but I can easily find five minutes to show them some affection. 2. Play with your cat. Boredom also strikes cats as it does with people. Buy a new cat toy or make something that your cat can play with. I find my cats go wild over a simple cardboard box. I don’t know what it is about cats and boxes, but both my cats love to play with them as well as finding them a comfy spot to sleep. 3. Give your cat a treat. My cats come running when they hear the treat drawer open. Princess can be in a dead sleep upstairs in the bedroom and as soon as she hears the squeak of the drawer, she comes running, I hear a drop upstairs and pitter patter of her paws down the stairs. Misty will gently take the treat from my hand with her mouth. Princess, on the other hand, will swipe my hand with her paw to try and get the treat. 4. Clean litter makes a happy cat. A cat’s litter box plays an important role in their happiness. Cats like to keep themselves clean so it make sense that they want their area to be clean as well. Arm & Hammer recommends having at least one litter box per cat and keep it easily accessible to your cat. I have two litter boxes for our two cats and I know they share the boxes. In fact, the cats keep one box for #1 and another for #2. Go figure! Princess is obsessed with the litter box. She’ll watch me as I clean it and as soon as I’m done (sometimes even before), she’ll jump in and do her business. 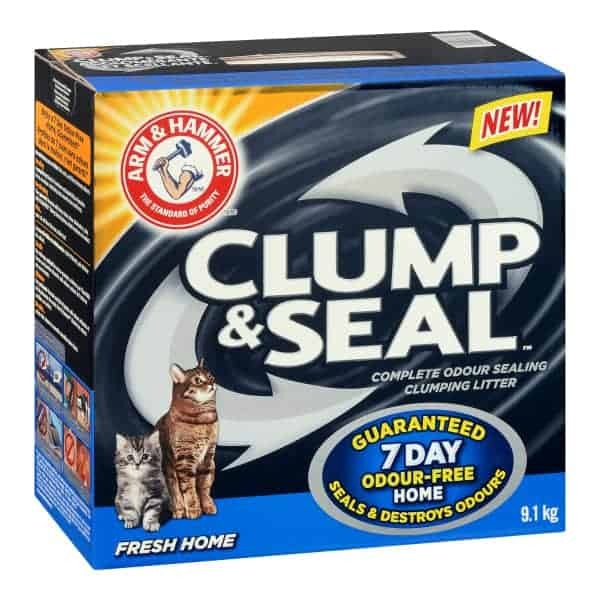 Clean the litter box often and use an odour neutralizing product like Arm & Hammer Clump and Seal Complete Odour Sealing Clumping Litter. It seals and then destroys odours for a 7-day odour free home and it’s guaranteed. You need to remove the solid clumps and waste daily to keep it fresh. What are some of the ways you show your cat love? Cute post. Simple things that easily show you care. Just giving them attention is very important. I have a dog but a love of animals in general. I do believe that they are part of the family. Our little girl is a cuddling, blanket dog that I know will expect a good Valentine’s day, too. She knows when my daughter gets in the vegetable drawer that she is going to get a piece of broccoli or cauliflower, too. From a dead sleep in the other room, she hears the treat jar open. It’s amazing how they train us! I LOVE the picture of the kitty cleaning session! I have 2 cats and they do that all the time. My husband was just saying this morning he wanted to try this littler! How funny! I wish I had a cat but I am allergic 🙁 I do however regularly show love to the dog, bird and lizards. The fish get random happy thoughts and food. Cat’s would be more fun! I have a cat and now I don’t think I could live without her.She is so precious.You just have to do the basics for them to love you back.I enjoyed your review.Thanks. I love your beautiful babies!! I show my cats all kind of love. Mostly by giving them the choice spots on the bed and contorting my body to sleep around them! Oh I really want a cat!! Really sweet! I truly wish I had a cat! Oh kitty is spoiled with special treats, toys and lots of cuddles. I love cats! They are so cute and funny! My cat just loves to be petted, and I would never have thought about getting something for them for Valentine’s Day. Your cats are so cute. And good cat litter is a must! Aww you’re cats are adorable! Mine are the same way with the treats. The minute I pick up their treats, all 3 come running.. no matter what they’re doing. Our 3 cats are very spoiled here! Definitely going to give this litter a try! Cute kitties! 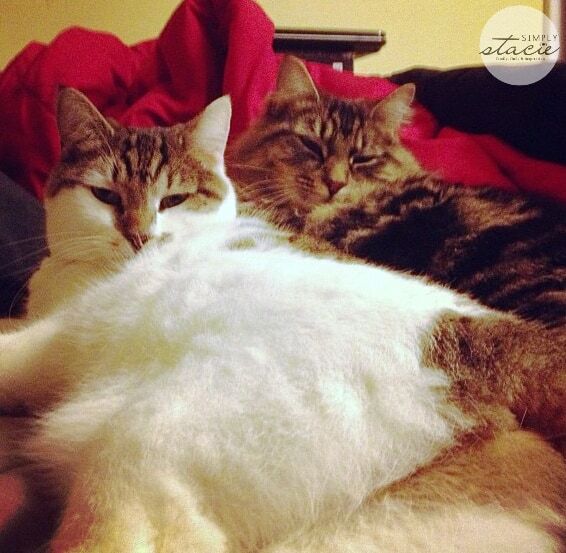 We have 2 cats – a 4 year old grey tabby & a 3 year old orange/white. Both are very spoiled and are definitely a part of the family (as are their 2 poodle sisters)! Adorable cats! Its important to show them love and have toys that they can play with! Aww your kitties are so pretty. I have two cats too. I love kitty cats so much especially my own. I treat mine good like that too. I invent new toys for them sometimes. We have good times entertaining each other. I wasn’t a cat fan for awhile after my growing up cats passed away, they told me I was allergic to cats a couples years ago. I have a small Yorkie, and my fiancee wanted to get a cat or a dog for him. We ended up getting her for free, she is so sweet and loves the dog. It was like they were meant for each other and she was meant for us. I think Valentines day and showing love should be a huge part of every one. Without love, where would the world be? I love my fur babies! I have two very spoiled cats. They get plenty of treats, attention and toys every day but I still buy them gifts for holidays! Love my cats to pieces! I am keen to try this litter as I am not happy with our current litter. Cute kitties! I love my cats and pet them whenever they will let me! Lol my cats are very independent and tolerate me only some of the time! I have 3 cats, and they are so sweet. I am a cat lover and always seem to have one or more as pets. Two of mine are rescues, and I have owned many others that have somehow found their way to me. They make the best pets because they picked me. We have two cats, both of them love to lay on my belly, however Hope, the elder of the two weighs too much and is so heavy. And they both come running too, especially Nellie when they hear the cupboard open, because it means they’re gonna get some food. Putting this down on my grocery list. I need to try this out. I love my cat to death but HATE the smell of his box. Your cats are too cute. I just wanted to squeeze them, but not in a bad way. You know what I mean?! I have always been a cat person.There just no smell worse than a litter box.I will check in to this cat litter. I bring my cat things that I find outside (especially on trips to unusual places).. feathers, rocks, leaves, pinecones, and even snow! She’s so curious and loves to smell things. She seems genuinely curious and intrigued by the objects. I WISH I WEREN’T ALLERGIC TO CATS. I WOULD LOVE TO LOVE ON ONE. LOVE THE POST. I HAVE A PRINCESS TOO, A CALICO & A THROWAWAY I NAMED SQUEEKY BECAUSE SHE CANT MEOW. THEY BOTH GET UP BY ME AS I SIT AT THE PUTOR ALL THE TIME. PRINCESS IS A BIG GIRL SO SITTING ON MY LAP IS HARD. SQUEEK HOWEVER IS A TINY ONE & CURLS UP ALL THE TIME. I WANT TO TRY THAT NEW LITTER AS MY GIRLS ARE SMELLY. I HAVE 3 BOXES FOR THEIR PLEASURE & ITS HARD, IM ILL, TO KEEP THEM CLEAN. THANKS FOR THE TIPS. Awe, such cute photos, cats need lots of love cause they give so much! I have two (2) cats. Marble (8) and Goldie (16), they both know the sound of their treat bag. It’s cute. Both of my cats get treats everyday and Marble gets brushed a lot, he has long hair. Goldie, well, he is just old and slow. I’m allergic to cats, but they are adorable. I find them to be the most affectionate of animals. I love my cat and do all the four suggestions. I just wish I loved his shedding. Love my kitties. And I love how they keep me warmer in the winter…. Sadly my husband is allergic to cats but I think that this advice is also great for dog owners too! This is so true. Especially about having a clean litter box. My cat screams if there is one mess in it. 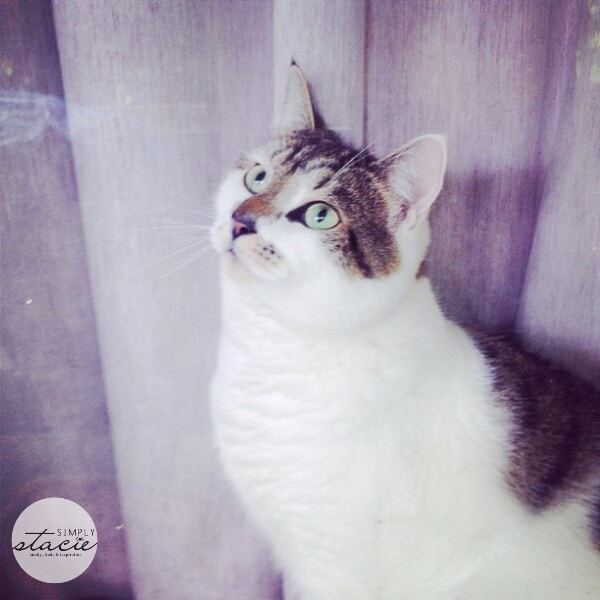 Adorable photos of your cats! Don’t have cats, but awesome advice! I just put my 2 19 year olds to sleep I need another cat .. Ahome is just not a home unless you have a cat or 2 or 3 …..
Awww, cute post. You are a good mommy. We have 3 cats… each of them are spoiled rotten. One is so “rotten” he answers to “Rotten!”. They are all VERY loved. I love cats, pictures of cats. Cats make our home complete. We have 2. My fur-babies are spoiled rotten lol.